Meet Otis King … or that’s the name on his office door. Maybe his original name sounded a little more Welsh, but didn’t sit too well on a Blues guitarist in the city of Memphis. 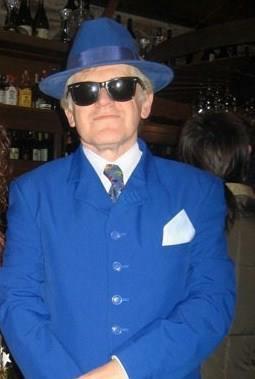 By day, Otis works as The Blues Detective. Pretty much every Blues related case in Memphis drifts his way sooner or later. Enjoy Otis’ adventures in bite sized chunks with your coffee, or better yet, a beer with a bourbon chaser. Otis is a fun guy, who does his best to avoid trouble and attract blondes. Some days he succeeds more than others. Join him as he deals with Hijacked Harmonicas, Missing Musicians, Wayward Wives and Precious Packages. “The Blues Detective” by Andrew Peters is a fun filled selection of short stories about a Welsh born detective in Memphis. To me, a European who lives with a Welsh significant other near Wales, this was quite a treat. The idea of having those two cultures clash and complement each other was very original in my view and worked well. The stories were short and to the point, well told and all had me smile at the end. Peters has a great sense of humour, some of his ideas are hilarious, other more low key but for me they all worked. I will pass this round my circle of friends. I am a very nasty, bitter person, shunned by society and currently live in a small village in Spain, under the protection of the Welsh Witness Protection programme, after a nasty run in with the Scotch Mafia. I am not really a writer, I just churn out an occasional story when the voices in my head speak to me. How come that your books are set in Memphis but you live in Spain? For much the same reason that Jules Verne wrote books about the Moon, but lived on Earth. It’s the right setting for a Blues Detective. Either there or Chicago, but Chicago is cold and I refuse to write about cold weather. Anyway, lots of my stuff isn’t set in Memphis, but in Barry Island, Hastings, Foxborough and a cheap hotel near Wolverhampton. 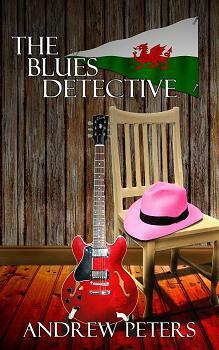 How did you come up with the Blues Detective, the title character of most of your books? The voices in my head dictate them. In the words of Sir Keef “ I prefer to think of myself as an antenna” Pretentious? Moi? Very bad Kindle writers. I was convinced I could do better. I was wrong. You write both short stories and novels. How do you decide when to keep it short and when to draw the story out? It’s not a decision…some stories take 1500 words to tell, some take 45,000. Some 6. Not really, certainly not Tom Cruise! Maybe Raquel Welch, but she’s frequently in my mind when I’m not writing too. Tell us a little about Joe Soap? It’s a story about a second rate Kindle author who finds himself in the unbelievable situation of being forced to murder people. It’s meant to explore how far the average man can be pushed, and whether people really care about what they have to do to others. What about The Barry Island Murders? It’s based on my memories of Barry Island in the 60s, meant to be told in flashback by a very old policeman. The years and the gin have dulled his memory for details, but he manages to remember the main thread of the murders. Yes, I enjoy murdering people, particularly ex-girlfriends, and I like Welshcakes and bourbon. I also own a Gibson 336. Full of cats, who both sit on the keyboard to discourage me from churning out any more rubbish.. I have full control over what I want on my covers, and I think they are the best in the world. They are designed by a mysterious figure who goes by the name of Joe Lumley, though I am told he is in fact the rightful heir to the Russian throne. Or a Peruvian hit-man. Just fine, it’s the only way my stuff would ever have reached any kind of readers, since it’s quite unsuitable for a mainstream audience. Stop. Please.You see all those people queued up in the street for Simon Cowell’s auditions? They all think they can sing, just like you all think you can write. 2% of them are correct. You have to be able to tell very good stories and use language really well. Most can’t. Fielding, Wodehouse, Runyon, Dickens, Christie, Conan Doyle, Simenon, Balzac, Robert B Parker and Stephen Leather. Me…and Paul D Brazill. Mostly me. Tom Jones. Maybe Tale of Two Cities. Or Gulliver’s Travels. Nothing at the moment, I don’t read much now, far too many other things to be doing. I only ever read on the Kindle, I can’t be doing with the small print in paper books. Hah! As if anyone would would dare to criticise my masterpieces. Maria Rodriguez Lopez……she’s very hard work! They are all brilliant, and available for very little money. 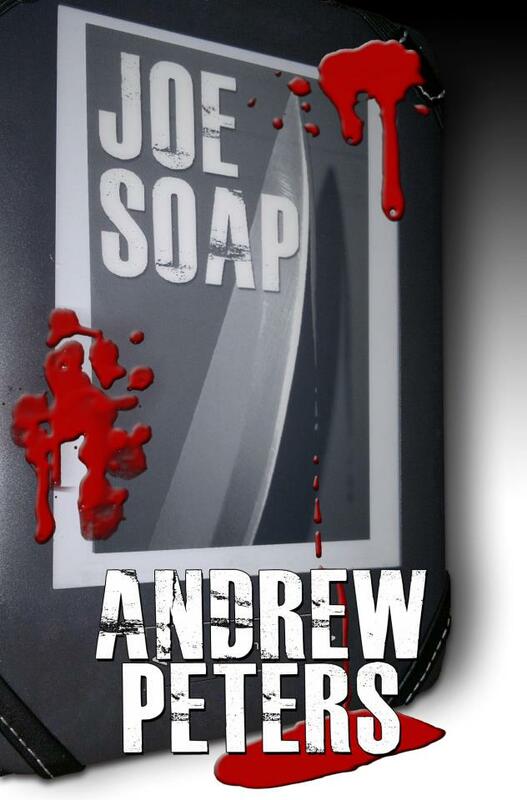 “Joe Soap” by Andrew Peters is a more dark novel by an otherwise more quirky writer. In this book the protagonist Jeremy Higgins is a writer of a series of crime fiction with a title character named Joe Soap (after his excessive love for washing and showers). Higgins gets blackmailed into assassinating what seems random victims without any connection to himself. As the assignments for new killings keep coming in we – and Jeremy – are none the wiser why they are happening, until more complex connections are revealed. Apart from some scenes in the middle that I would have liked to be tighter or faster I found this story very well written crime fiction but on a personal level I missed the quirky humour Peters is so famous for. This is a bit darker than usual but very good. 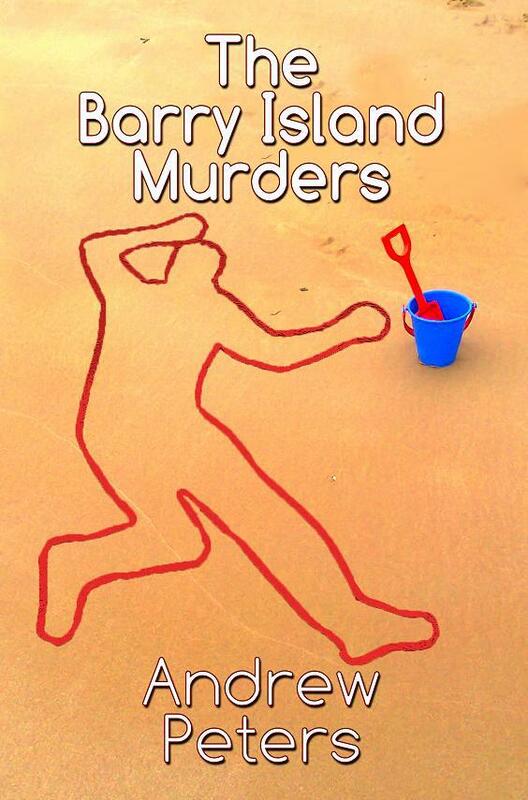 “The Barry Island Murders” by Andrew Peters are a very entertaining selection of murder cases on the Costa Del Glamorgan, Barry Island. Told in retrospect by Detective Williams we are taken into the world of the Welsh 1960s, where investigations were not done by CDI teams and DNA but in this case with luck, wit and common sense. The cases involve a dead body in the fun faire ride Journey to Mars, bodies on playgrounds and graveyards. The author makes a point about real murder cases and investigations, where not everything is known to the investigators, not every stone is turned and not all questions will be answered. Under those premises the focus shifts from brilliant clue leaving and confusing the audience to painting a beautiful picture of the times, sentiment, nostalgia and quirky humour tell of the times gone. The novel might not earn its five stars for genius in crime solving but it deserves it for originality, quality of entertainment and a great main characters. The Welsh connection for me might have something to do with my personal enjoyment but I recommend you give this a try. “The Venusian Vamp” by Andrew Peters in my humble opinion is a fantastic short story that made me laugh out loud throughout. 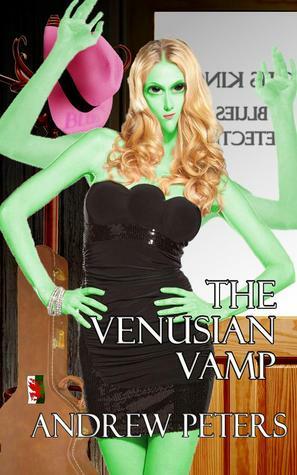 The Welsh Detective in Memphis is visited by a multi-tongued, green-skinned blond bombshell from Venus, who hires him to help her minority Venusian community deal with some unwanted interference in their business. The description of those creatures as well as the whole idea re really hilarious, Peters’ humour at its very best, this is easily my favourite of his work. I won’t say any more than this to make sure I won’t spoil the fun, but if you read only one of his books and shorts, make sure it is this truly great fun story. Andrew undersells himself a bit. Not a lot but … anyway, good stuff and ta for the mention! Thanks for having me….sorry for leaving a mess. Well there is nothing more entertaining than a good bit of drama. I never said anything about Paul D Brazill….I suspect some News Of The World style hacking! He managed to get your blog cencored? How delectably decadent. I need more details. If only Wand, the interview is so surprisingly harmless. Andrew is a master of underselling himself. His books will have you laughing and snorting like an asthmatic warthog or your money back! er…….what is this “refund” stuff, Mr Sant? Thanks……didn’t I read a story of yours lately in Alex Shaw’s anthology? That’s probably true Andrew. The concept for Death Toll was mine originally and grew when Alex got on board. I like to promote other indie authors so if you ever want a re-tweet or blog mention just let me know.